From booze to canned ideas, we spoke to writer and director Yoko Taro and PlatinumGames designer Takahisa Taura about the creation of last year's surprise JRPG hit, Nier: Automata. While sitting in a tiny room with Nier: Automata's writer and director Yoko Taro and PlatinumGames game designer Takahisa Taura during the Game Developer's Conference, I realized I was chatting with two opposites. Taura is a tad quieter and is more calculated in his responses. Taro, on the other hand, says whatever comes to his mind almost immediately. Taura is more technical and has a passion for "keeping controllers alive," while Taro maintains a theoretical mindset, thinks consoles, mobile, and even vending machines will all merge into one congruent entertainment platform one day, and enjoys drinking highballs ever since his doctor advised him to stay away from beer and wine. And yet despite their differences, the duo helped create Nier: Automata, one of last year's most widely celebrated games. It was a hit for both Taro and Taura. For the former, Taro became a more recognizable name for video game fans; for the latter, it was a return to form for PlatinumGames, a studio that's been peddling out licensed games in-between Bayonetta 2's limiting Wii U release from 2014 and the flawed Star Fox Zero in 2016. Nier: Automata was a dual, triumphant comeback for the ages. But it took awhile for its creators to relish in the game's surprise success. Spoiler Warning: Spoilers for the end of Nier: Automata and Nier ahead. Early concept art of the desert and abandoned apartment complex in Nier: Automata. On The Road to "Success"
"In the few weeks after release, we had a concert for the Nier series. [It was] like a staged theatrical reading. And I had to write a scenario for that, so I was pushed on the schedule and the deadline for it, so it actually felt more like hell than success at that time," Taro tells me. Taura also felt the pressure, as looming bugs were discovered in the game by the team and by players. The urgent, necessary patches made Taura feel "really bad." "So just to summarize," Taro continues. "Just a few weeks after release, we did not even have a fun time [because] we didn't really feel the success of the game." Eventually though, the success hit. For Taura, it was all the collaborations that happened after the fact with mobile games and even other titles. For Taro, it was seeing the passionate fans materialize, just as the original game's fanbase had even when it sold 500,000 units, compared to its sequel's 2.5 million units sold worldwide. Success, for Taro, has never been measured in popularity or sales, but in the fervent love fans have for titles. But the start of the Taro and PlatinumGames partnership was rocky initially, in more ways than one. "For PlatinumGames, it was a challenge to even create an RPG because we've been making action games," Taura says. PlatinumGames' most well-known titles include Bayonetta, Vanquish, and Metal Gear Rising: Revengeance—games with hardly any RPG elements at all. "And so while we were developing the game, we played great RPG titles like The Witcher 3 together to try to get as many hints as possible into creating a good game." Taura also notes that the horizontal sequences of the game, where the camera changes to an unchangeable 2D view, were inspired by his love of the Castlevania series. The challenges Taro faced were a bit milder, as a statesmen of the RPG genre for over a decade with the Drakengard series. "[PlatinumGames'] start of the work day is at 9:30am, and as a freelancer I can't wake up that early. So we actually had one month where we were constantly arguing about it, and Nier: Automata actually was about to be canceled because their start time was so early for me. And that's actually not a joke," Taro says. "But at PlatinumGames now we actually have what is called free time, like a rolling schedule [where] you could come in whenever you like, so we don't have that issue anymore." Sequences where the camera shifts to a stagnant 2D perspective were inspired by the Castlevania series. Development on Nier: Automata got a little less bumpy after that minor hiccup. With Taro able to roll into work whenever he awoke, sleep-related conflicts were mitigated. At last, true production on the game began in earnest. The game became a collaborative effort between Taro and PlatinumGames as a whole, with things like Taura's Castlevania-inspirations cementing within the game. For the shooting aspects, Taura and PlatinumGames found themselves a little stuck. To help alleviate the process, Taro stepped in for guidance. "Taura-san doesn't really like shooting games, [...] so I ended up creating a video to demonstrate what kind of game I wanted," Taro says. "I didn't really give them any detailed directions for the rest of the game. But for the shooting parts, I gave super detailed details as to how to make [those sections]." Our conversation is happening on the Thursday of GDC 2018, as the conference is winding down and some are even readying the long trips home away from the chaotic city of San Francisco. It's also a day after Taro and Taura's GDC talk; a panel that was split down the middle. Taura spoke at length about 2B's attack animations, while Taro sped through his own half of the talk as time was cut short, elaborating on the concept of freedom and what it means to him, as a writer and director of video games. For Taro, freedom is the ability to challenge oneself for anything. In this sense, freedom in game design doesn't necessarily come from the creators themselves, but what players are able to do that's unexpected, whether they're personal revelations or playing with the mechanics at hand. "I think that helps blossom the imagination of players," Taro explains to me after I ask him to elaborate a little bit more on the topic. "When I was creating Nier: Automata, that was one thing that I had in mind as well, to be able to create a game like that where players have the freedom to do things on their own and then find things out for themselves." Taura similarly believes freedom in game design to be more on the player's part than the designer's. "I mean, even in real life we say we have freedom, but that doesn't mean that we could fly. And so it's not that we have ultimate freedom," Taura says. "I think that the word freedom in itself is just a very nice vehicle to use, especially when it comes to marketing games because when you say freedom then the player will imagine things on their own." 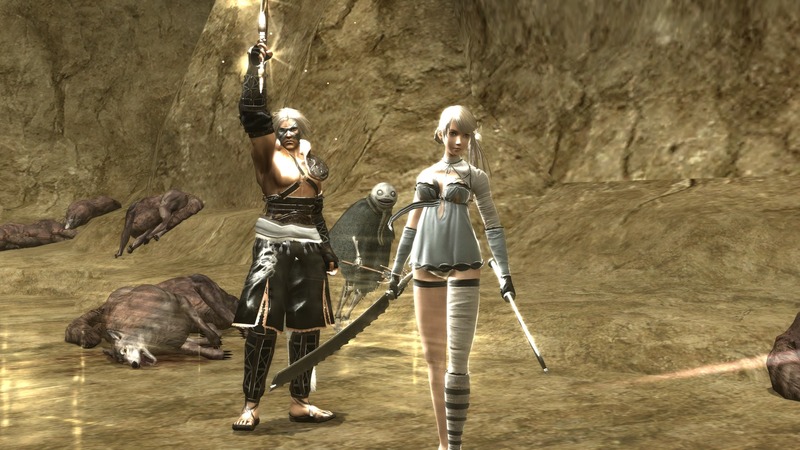 Nier (2010) garnered a cult audience despite being critically panned. Over the course of development, a lot of ideas were cut from the final game. One of them, which Taro and Taura say they nearly forgot about, had to do with the big climactic battle at the end of Route C and D of the game: the fight between A2 and 9S. Originally, if players selected to play as A2, they'd lose all their items and weapons; if they chose 9S, they'd lose all their earned experience. No matter what, players would be left with a disadvantage. This idea was cut, and it's not the only one. "At the beginning of the game, we actually had an idea to have a co-op mode where you could actually move the pod around yourself to help others. I did have a concept document for it and everything, but it just did not make it in," Taura adds, including that at one point, they considered having a versus mode where players could fight 2B against 2B—akin to a part during 9S' arc of the game where he battles an onslaught of 2Bs. "The reason why we took away those online features was that we did not want to create something that felt mandatory to do. We wanted to have it something more just kind of there to [have an] experience or connection with the rest of the world. So we took those concrete, definitive connections out of the game." As for what did make the cut, Nier: Automata is loved by its fans for many things: for its story and the wild twists and turns it takes; for how self-aware it is; for how it turns players' actions on its head, whether it's taking control away or plopping the player into unexpected situations, like shooting their way through the credits. It's beloved for the way it flips its camera between vantage points—from arcade shooter to top-down, 3D action—and swaps between characters unexpectedly; for its quirkier side elements, such as the shopkeeper that sells PlayStation trophies for the players who are coincidentally lazy and flush with in-game cash. If anything, the action, which is tame by PlatinumGames' lofty usual standards, gets criticized the most. And yet another interesting element buried in the peculiar JRPG that doesn't get as much lip service is its "chip" system, where players can equip and unequip abilities, parts of the HUD, and surprisingly even kill themselves by accident in removing their OS Chip, booting them back to the title screen. "Video games nowadays, they're just really nice to players," Taro says. "They don't do things that players might be enraged about, but being able to do something like [trick players into removing their OS Chip], I felt that there's still hope in video games to be able to do something that kind of nudges or pokes at the player." 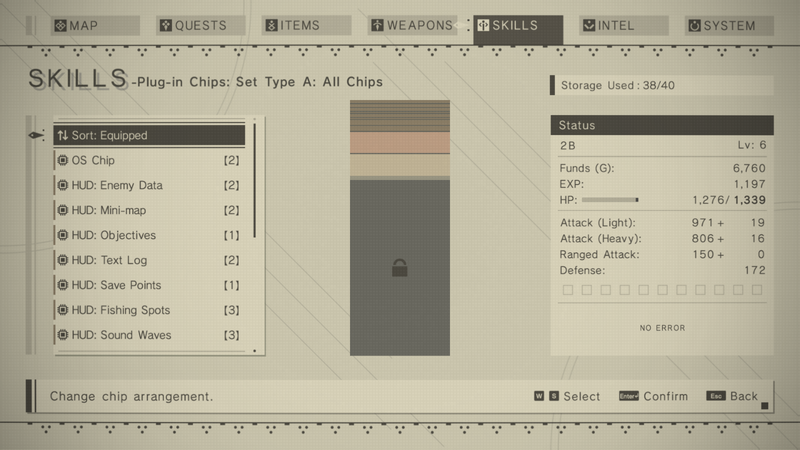 Nier: Automata's unique plugin chip system lets players remove their entire HUD if they want to. The chip system, in particular, went through different iterations according to Taura. The system was a twist on the "word" system from the prior entry in the Nier series, where "words" were magical spells that allowed the player to improve and equip weapons, skills, and magic abilities. 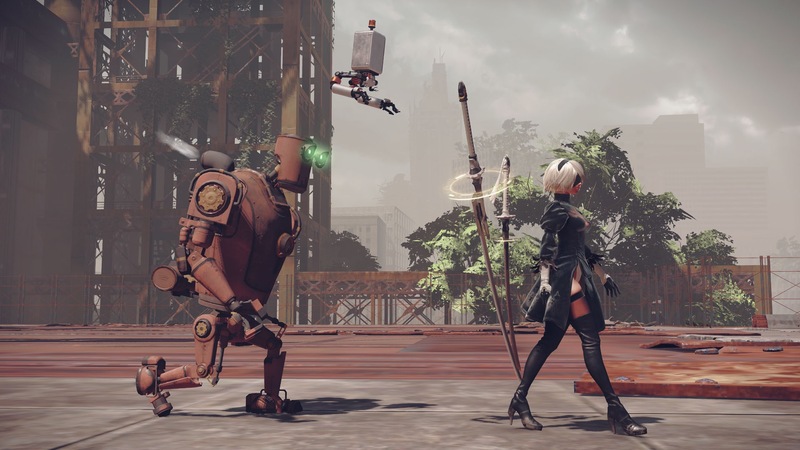 And because Nier: Automata circled around androids as the main characters, a chip system similar to computing made the most sense in terms of its direction. "There are a lot of chips that don't really make sense probably, that are just kind of too out there and just doesn't help you with anything in the game," Taro says. "But we felt that having those options also kind of reflects reflects real life where there's a lot of choices and some just don't even make sense. [...] I do remember one thing that [ended up on the] cutting board. Right now in the game all the chips are stacked into this bar-like meter, but we originally had this idea to create something more like a Tetris-like puzzle piece where different plugin chips would have different shapes and sizes so that some chips might not fit in well with others, or you would have to try to figure out a way to fit in that chip with another. But we just had to do away with that because we didn't have enough time. [laughs] This is actually something we've never said anywhere before." There are other aspects that Taura and Taro point to that they're particularly proud of, from Pascal's story arc (and for Taura, the admirable voice actress behind Pascal) to the end boss sequence where the game bounces between A2 and 9S as they unknowingly battle the same foe, just from different ends. Taura specifically notes the tempo of that particular battle as what makes it special to him, as if A2 and 9S are dancing to the same particular beat as their destinies collide. Only, you know, brutally and with violent action. Pascal is not only a fan favorite character, but Taura's too. Nier: Automata, by extension of its predecessor, was designed to amend one flaw Taro saw in the reaction to the game. He wanted Nier: Automata to be open-ended. That is, truly open-ended, with no misinterpretation or wrongful, concrete conclusion to be drawn from it. "[The first Nier] had this overlying sad tone and what I wanted to do was to show that there's just duality in the world, it's just not one side. But what happened was that a lot of the players started to say that the flipside [of the first Nier, showing the darker point-of-view] was the real side of the world, like 'that's the truth and that's what Yoko wanted to say.' That happened because of the way that I created it, and it's my fault for doing that. But that's not what I wanted to do," Taro says. "I just wanted to show that there's duality. And so for Nier: Automata, I tried to create the game in a way that you can't really tell what the truth is. And so I wanted the players themselves to just play through it, think about it, and try to find the truth [themselves]. And I think that's the most fun you could get from a game." Part of that shift in terms of its broader ending came in how players got to that point, and the save data they were urged to sacrifice along the way. This is where the tangible connection with other players in a non-multiplayer setting was solidified, with the rest of the world coming into play for the game's finale sequence where players had the option to help other strangers playing the same game survive the final, brutal bullethell challenge. This ran contrary to the first game's similar save data deletion, where players sacrificed their own data to save another character in the game, wiping their in-game existence in the process. In Nier: Automata, the save data isn't to save a fictional character, but a real person playing the game somewhere across the world. This was inspired, of all things, by Coca-Cola. Or rather, the Coca-Cola Company's Small World Machines project, where people from India and Pakistan were connected briefly via Coca-Cola vending machines in an effort of unity during a feel-good marketing stint. 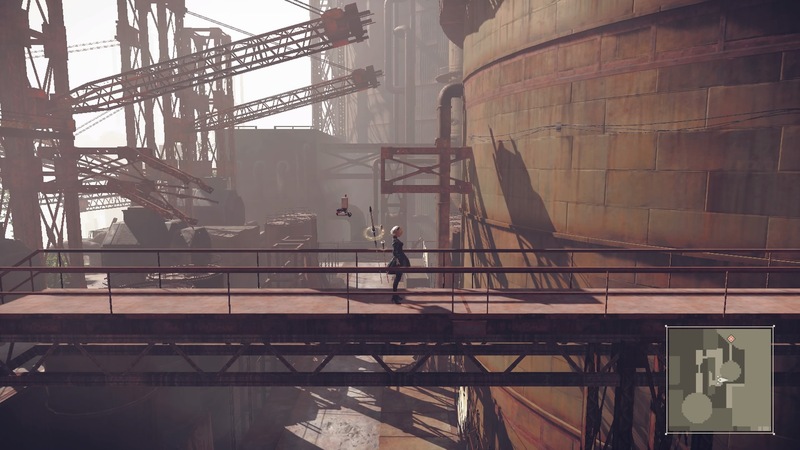 Similarly in Nier: Automata, Taro wanted to establish real world connections beyond the confines of the video game. And since a similar save data deletion mechanic happened in the previous Nier, Taro had to play with players' expectations. "Video games nowadays, they're just really nice to players. They don't do things that players might be enraged about." It's an odd inspiration too—to find a connection in a marketing gimmick. I ask both Taro and Taura if they've found inspiration in any other worldly things, whether they're in games or not, and Taro turns the conversation in an unexpected direction. "I do have one thing in mind, but it's just so political that it's a little bit difficult for me to really dive into in detail," Taro says. "But one major point is the ISIS movement, where I felt that of course there's still difficulty in humans to understand each other, but I was feeling that we were all moving towards a mutual understanding. But recently I feel like we're falling apart from each other more and more and more. It's not going the way that I had envisioned the world would be. And so I feel like that is one of the just fickle situations that we're facing up against in the world." There's silence for a moment, before Taura breaks it. "I want to just leave it at that because it was such a good story. I don't want to break that." Taura laughs after saying that. Taro lightly jabs towards Taura, baiting him into talking about "a girlfriend you were dating recently," as something that's affected him, just as the current political climate has Taro. "I don't think this is the place to do that," Taura replies. Then, it's as if a lightbulb goes off in Taro's head. "We just need some alcohol to do that." As for the continuation of their partnership, of Nier as a series, and of the now-notorious Yoko Taro writing and directing games, the future is unknown. "As long as Saito, our producer from Square Enix, gives us money, we'll do anything that he wants us to do," Taro says. And after the rollercoaster of a year Nier: Automata's had, Taro and Taura might want to top off their highballs one last time before they'll surely be tasked back to work. Tagged with Feature,	Nier,	Platinum Games,	Square Enix,	Takahisa Taura,	yoko taro.